Are you looking for an easy way to save money on everyday purchases? The Ibotta app is perfect for you. I just recently started using the Ibotta app and I must say I really like it. My only disappointment with it is that I downloaded it months ago and only got around to using it in the last month. I could have been saving so much more money–or earning really since Ibotta is a cash back app that pays you for using it. It doesn’t take long to sign up for an Ibotta account –go here and create one. When you open the app, you will see a small symbol of a magnifying glass at the bottom with the words “Find Rebates” underneath it. Click on it and you will see a search bar at the top, a favorites section below (of course if you haven’t used Ibotta yet you won’t have a favorites section) and then below that a browse by category section. I click on the icon for the store I want to shop at in the favorites section or if it isn’t listed there I enter the name of the store into the search bar. When you click on the store of your choice, the offers available there will pop up. Scroll through them and pick the ones for items that you plan to buy. Most offers will be for specific brands, but Ibotta does often offer Any Brand offers and these are so cool! An Any Brand offer means that you can claim the offer regardless of what brand of that item you intend to buy. So if the offer is for milk, you can buy the store brand and still claim the offer. Once you have picked your offers, you can then go shopping and pick up the items for the offers you claimed. Make sure you get your receipt and neatly store it away–crumbled receipts are harder to photograph. To redeem your offers, you need to open your Ibotta app and press Redeem. Pick the right offers for the receipt you are claiming first and then follow the instructions. When I have claimed an offer, I usually receive it in my account within a few hours, but it can take longer. To withdraw your cash, you need to have a minimum of $20. When you reach $20, you then have several options for your cash out. You can have the money deposited in your Venmo or Paypal account or you can pick from several gift card options. These gift cards are sent to you electronically through email. You should receive your cash out within 24 hours. You can also link your store loyalty cards to your Ibotta account and skip the uploading the receipt step. Just make sure to use your loyalty card at the checkout. If you prefer to shop online over in-store, Ibotta can still save you money. And the first step to doing that is to of course sign up for an account. Let’s say you want to buy a daily deal through Groupon. Open up your Ibotta app and click on the find rebates tab found at the bottom of the screen. Type Groupon into the search bar that appears at the top of your screen and all current offers for Groupon should pop up. Click on the one that matches your purchase and you will be taken directly to the Groupon app. Of course, Ibotta offers many more in-app shopping options than Groupon so be sure to check before you start shopping through your favorite shopping app. Once you have gone from Ibotta to the shopping app of your choice using the direct link Ibotta provided, make your purchase and then Ibotta will take care of the rest. How long it takes for you to receive your cash from mobile shopping will depend on the retailer. As stated above you must have $20 in your account before you can request a cash out. Ibotta holds teamwork challenges. When you use my referral link to sign up for an Ibotta account, you will become a part of my team. When a team reaches certain goals bonuses are given. 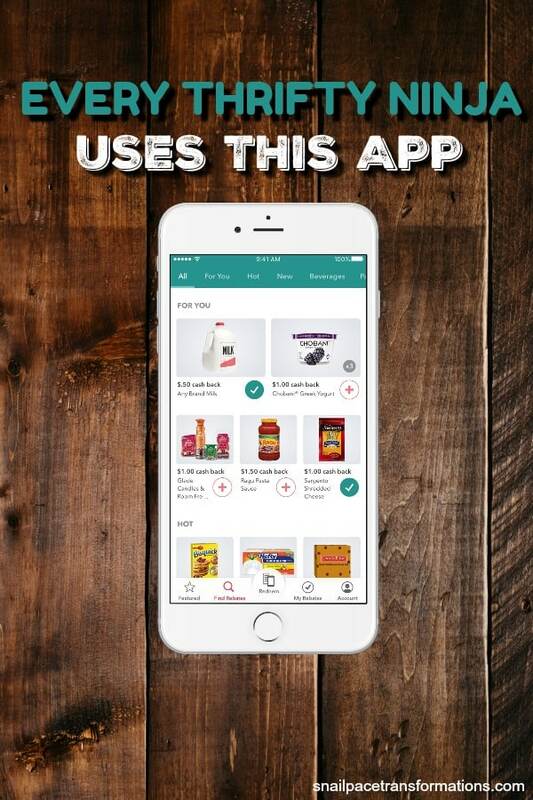 When you buy featured products, redeem items at specific retailers, or complete certain tasks you can earn bonuses. Ibotta offers a referral bonus for friends that sign up using your referral link or code. These three additional ways to earn can add significantly to your monthly earnings through the Ibotta app. Ready to start earning cash back with Ibotta? Go here to sign up. Thrifty and Thriving: More Life for Less Money is not your typical “how to save money” book. It does not list 25 ways to save on food or 10 ways to decrease your electric bill. Instead, it shares more than 40 key practices and principles that thrifty families use every day. Get your copy here. Available in both paperback and Kindle on Amazon. Can you give more information on the type of tasks you have to do? Do you have to promote it on Facebook, things like that? You don’t have to promote it on Facebook, although they do run referral bonuses, which will certainly add to your earnings. Mostly it is a rebate program where you just submit receipts for the qualifying items you buy. They offer rebates on milk, DVD’s, movies, dishes, water bottles, food and a lot more. The offers change frequently so you need to look through the rebate section regularly. Now that I have been up a while it hit me, you mean what you have to do to unlock the savings! Yes I have been asked to share something to Facebook, but most times it is a short video to watch or a survey to fill out. Hope that helps. I LOVE ibotta! I have been using it for about 6 months and I have earned $75.50! I would be very happy if it learned the types of things I buy and tailor the rebates a bit more. They get copies of people’s receipts…I would think they could really track the most popular things that people buy. Some of the stuff is totally irrelevant and you can only delete 4 rebates out of your list per day. When they reset the offers the ones you deleted come back! All in all it’s awesome…I combine its use with Jingit, Checkout51 and ReceiptHog to get a lot of bang for my purchases! iBotta is great! I used to travel all over the U.S. and they had options for stores everywhere. It was fantastic. The only problem is occasionally I’d be tempted to pick up something I didn’t really need when it popped up on there… mostly though, it’s terrific and it’s got things you really need like milk and eggs. It sounds great but I don’t find it very easy. There’s a lot of steps involved and it seems very timd consuming. I tried using it on WalMart purchases. I followed all the steps but I was not successful and it was frustrating. I tried several times to scan the barcodes, etc., and follow the steps but no luck. When I first started using Ibotta, I too found it difficult. However, you can email [email protected] and they can provide you with assistance on scanning items. In my case, I was leaving other apps open while attempting to use Ibotta, so it was slowing down the performance of the app. Fun to read since I finally signed up about a week ago. I redeemed my first item (bread). Now it seems like the bonus is 50 cents if you redeem your first offer within ten days. I’m looking forward to using it more! I am glad you like it. I find it a handy app to save money on all sorts of areas of our budget. I am new to Ibotta and my iphone! Do I have to “log out” of the Ibotta app when I am done so that I don’t use up my data (if I’m not on Wi-Fi)? I know with Facebook I have to scroll down to the bottom and log out before I close the FB app. Does Ibotta work the same way? I can’t find a place to log out! If you don’t want to use data when you are not in a Wi-Fi area you can simply go into your iphone settings and and change the “cellular” to off that way you data won’t come on in an non-Wi-Fi area unless you actually put it on. The other thing you can do is go into Notifications (also found in settings) and turn them all off for all your apps, that way the apps won’t send you updates, you will just have to go in and manually check them, which would also save you data if you should turn it on. Hope that helps. Please tell me why this app requires access to my contact list and my pictures and so many other things on my phone that have NOTHING at all to do with shopping or eating out?!?!?!?! I don’t remember being asked about these things, but I did sign up around a year ago. I used an iPod to sign up so it wouldn’t of had contacts. The picture part is because you are going to use your camera to upload the receipts so it needs access to it. I can kind of understand the part that you said about the pictures but, it’s telling me that it needs access to my external storage. Not the pictures on the internal DCIM storage where any pictures, that the camera takes, are saved. I don’t know. I’ll do some research and try to acretain why it needs access to these things and I’ll let you know if I find any answers. In the meantime, I don’t believe I’ll be installing this. I started using Ibotta, along with several other grocery/rebate apps about 3 weeks ago. I am testing them all out for a month to see which ones work best for me and my family. I LOVE Ibotta so far! I have referred some family and friends too, and gotten referral bonuses ($5 each, not too shabby). And it’s fun because you can build a team and help each other earn more. And now you can link your loyalty cards and unlock your rebates before you shop and it automatically finds the matches and pays you without having to scan the barcode or take a pic of the receipt! Works for me! Hope that helps someone! Have a great day! Thanks for the tips. I am glad you are enjoying Ibotta. Can you purchase item’s online from the specific store and claim on IBOTTA? I am not sure I have not tried using it that way. I just signed up for Ibotta with my ipad mini. Got .50 cents right away for any receipt. Can I even use Ibotta without an iphone. I don’t think I can scan but I can take picture. Just figured it out. Success. Great! I am glad it worked for you.